[vid] Navajo nation contaminated by uranium ore In Northeast Arizona the Navajo nation is living on contaminated land. The land was once full or uranium ore and in the 1940's the Navajo natives were employed by the US government to mine the Uranium ore. But since then the Navajo have been suffering severe health issues from the contamination of the elevated levels of radiation. On the way to Flagstaff we stopped at Four Corners, which is the point where Utah, Colorado, New Mexico and Arizona meet. It’s also a natural vortex & formerly a national park. 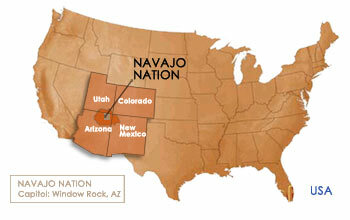 Now the Navajo tribe owns it and regulates the activity there. We didn’t see any smog on our drive through the Ute Reservation in Utah, but suddenly we were immersed in it as we arrived at Four Corners to offer the holy handgrenade to the guardian of that vortex. Carol said the vortex was being kept pristine by the Navajo shamans, but that our offering had been accepted in honor of the unity of humanity. A very old raven showed up and appeared to want our attention. Carol told me to follow the raven to find the right spot to put the Holy Handgrenade (HHg), and just then the raven flew to a pile of large stones about a hundred yards away. I went to that spot and put the HHg in among the stones as the raven watched from a few paces away. Carol said she saw a Navajo woman’s image superimposed on the raven.